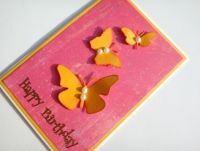 A firm favourite with crafters these butterfly die cutterswill create gorgeous die cut butterflies from card, paper or fabric. The set consists of three butterfly cutting diesin three different sizes and designs, ranging from 4 - 6cm wide. Use them to create your own card or scrapbook embellishments or as the main feature of your project.